We could say that our Quiet Treehouse is back with a bang, except that it’s kind of the opposite. 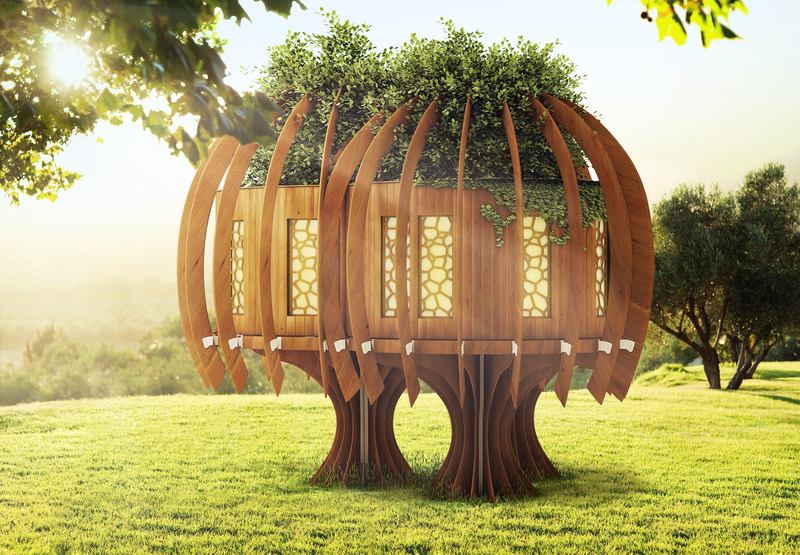 Designed to showcase how “quiet technology” can be used to create a refuge from the racket of modern life, the Quiet Mark Treehouse and garden by John Lewis announces itself silently. The Quiet Treehouse is among the central features of this year’s RHS Hampton Court Flower Show 2014 that opens today and runs until 13 July. The Quiet Treehouse is the initiative of Quiet Mark, the international mark of approval from the UK’s Noise Abatement Society. Quiet Mark is the ensign of quieter design for technology, borne from a vision to reduce unwanted and unnecessary noise in our environment. Earlier this year, Quiet Mark partnered with John Lewis, Retailer of the Year (2013), and approached Blue Forest to design and construct a tree house to embody this vision. The Quiet Treehouse made its first debut at the Ideal Home Show in April this year, where it was welcomed with great enthusiasm. It returns this week as one of the central features of the RHS Hampton Court Flower Show. This time set in a designer garden, created by David Domoney of ITV’s Love Your Garden, it will echo the show’s central theme: “Grow, inspire, escape”. At Blue Forest we were delighted to be able to breathe life into such an admirable and exciting concept. As renowned luxury treehouse builders, we could draw on vast design experience and were able to source some of the world’s leading materials in sound proof and eco friendly construction. The result is a haven set in a designer garden that surpasses all pre existing ideas of quiet living. The acoustic insulation on the outside of the treehouse will offer the same sound insulation as a 30 cm solid concrete wall. And whilst there will be no sound leaking in from the outside, the inside will be equally tranquil. The interior is furnished and equipped by John Lewis as well as feature sponsors Lexus and Panasonic, and features a range of Quiet Mark approved high performance technology. Although it uses some of the most advanced in quiet technology, the treehouse retains all of the authenticity of a organic, natural design. 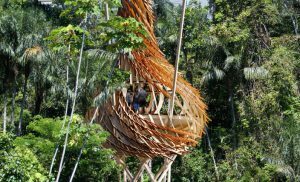 The shape of the Quiet Mark treehouse by John Lewis takes its inspiration from a copse of trees and the fins underneath its deck are intended to remind viewers of the shape of buttress roots. Read more about the treehouse and its construction here. Then come and see for yourself. The Quiet Mark Treehouse and garden by John Lewis will be at the RHS Hampton Court Palace Flower Show 2014 until 13 July 2014 and will then be donated to a children’s hospice for children and their families to spend time together in peace.